Rectangular is the new round. A friend of mine and I have a longstanding tradition that every time I head home to Michigan, we make a special trip to Buddy’s Pizza in Farmington Hills, a Detroit suburb. The most recent trip was even more special because I hadn’t been home for a solid nine months, and because Buddy’s had recently been ranked one of the top 25 pizza places in the country. We took a seat at their relatively new outdoor seating. Being regulars, we had no need to look at the menu and ordered our usual, a large pepperoni pizza. To accompany our pizza, we ordered a round of drinks indigenous to the area. My friend got a Labatt Blue, imported from across the river in London, Ontario, Canada, while I ordered Bell’s Oberon, from the Bell’s Brewery in Kalamazoo, Michigan. Bell’s is a special brewery that doesn’t have too much distribution outside of Michigan, while their Oberon is only brewed during the summer. Combine those and you have a truly rare beer that I was especially happy to be ingesting at Buddy’s. When the pizza arrived, it was just as I remembered it. 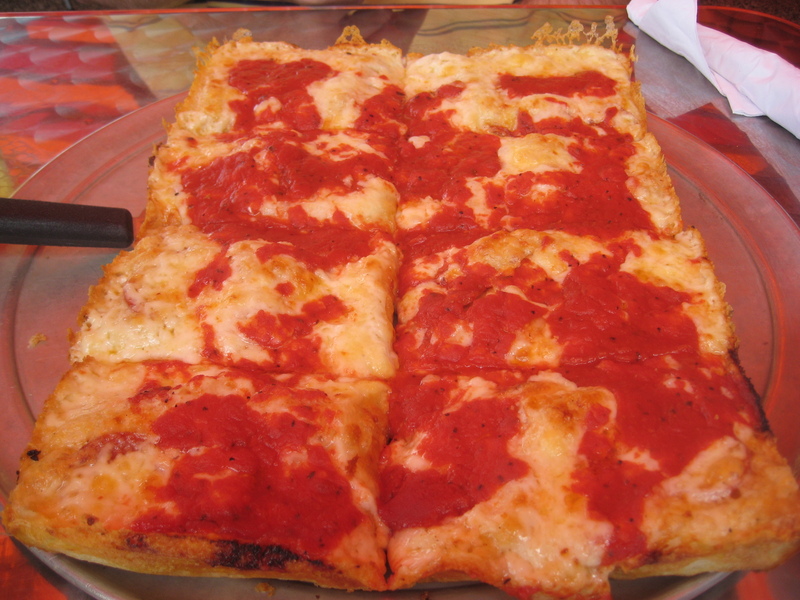 Rectangular, thick crust, sporadic sauce and a cheese that was virtually indistinguishable from the dough. Somewhere under the sauce and cheese was pepperoni just waiting to be found and eaten. And eat we did. In about 15 minutes the entire pizza gone, as were our beers. We ordered another round of those delicious beers and enjoyed Michigan’s beautiful summer weather. Good pizza, great beer and better company; Buddy’s Pizza is always a place to go in Michigan. 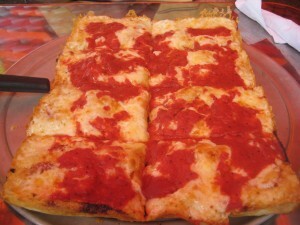 Although I am typically more of a fan of round pizza, Buddy’s sure knows how to make their rectangular pizza right.